The Pit Bull was America's favorite dog for more than 50 years. They were beloved by everyone from the poorest to the President of the United States. Teddy Roosevelt bred them for over 30 years. These two boys were clearly on the lower end of the economic ladder but they don't seem to be aware of or concerned by their social standing. All three seem to be having a great time and I'll bet that as soon as the photo was taken, they were off on their next adventure. I'm told that the trio could have been a part of the Our Gang films. First of all, I want to say I NEVER leave a bad feedback AND I was fully refunded, but this was a pretty bad experience. Was supposed to come as a 4x6 (as advertised) to fit a vintage frame I had. I had to ask to get it mailed out (it was late due to sickness, which I totally understand), but the seller should have initiated communication about this. Then I was mistakenly given the wrong tracking number, and when it did arrive, it was the incorrect size. The seller has good feedback which is why I chose this shop...multiple errors make it hard for me to recommend this shop. I would have preferred the seller to make me the correct size even though it was for a gift, but I was refunded and told to reorder. No thank you. Sad about this. 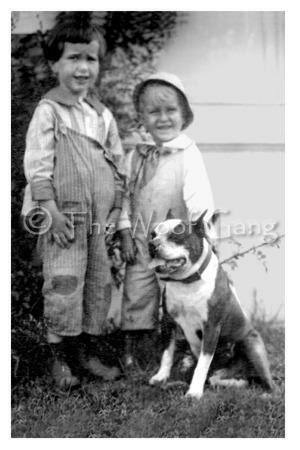 Vintage Dog Card --Children with Pit Bull Pal, c. 1905, U.S.A. Excellent quality photo and was packaged with care.